VICKSBURG, Miss. 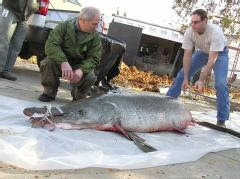 -- A Vicksburg man pulled a 327-pound alligator gar from Chotard Lake in Issaquena County, Mississippi wildlife officials said. Kenny Williams caught the fish on Valentine's Day. Biologists with the Mississippi Department of Wildlife, Fisheries, and Parks weighed the fish at 327 pounds. It was 8 feet 5 ¼ inches long and 47.95 inches around the body. "At first I didn't think he was that big. But as I was getting him into the boat, it was like, 'How big is this thing?' It was a lot of effort just to get him into the boat," Williams said. "I don't even know how to describe it. It was just huge and hard to get into the boat."